Now you don't need to face distraction and enjoy the truly clear display of smartphones with Samsung S10. The slight addition in every model of S10 series satisfy the smartphone lovers beyond their expectation. The infinity-o display is one of those features which wasn't found before in any smartphone and justify with Samsung Galaxy S10 price in Pakistan. Samsung phones come with a ground-breaking screen with Dynamic AMOLED, on-screen security and precise laser cutting. Full HD is the default resolution of Samsung Galaxy S10 but you have an option to transform it into Quad HD+ and set the display as per your need. Photography is an art and approximately everyone want to save memorable event of their life in the form of image or video. A camera is an essential feature of any smartphone that's why developers of Samsung Galaxy S10 series focusses to give value to the camera of Samsung galaxy S10 and Samsung Galaxy S10+. Both models have 3 rear cameras with different lances to capture the ideal image either from far or near. The rear cameras are identified as a wide, telephoto and ultra-wide and arrange in the same sequence as Galaxy A7. The wider lens captures the broad area into the screen of a smartphone as it is12 MP camera with f/1.5-2.4 while 12 MP ultra-wide camera with f/2.4 have an ability to capture a clear view of a broader image. Telephoto lets you click the image from a different angle with its 16 MP and f/2.2 features. Auto-HDR, LED flash and panorama are some additional features of each model of the Samsung Galaxy S10 that will let you control the brightness and focus while capturing images or recording videos. Either rear cameras are the same in the Samsung Galaxy S10 and Samsung Galaxy S10+ but both models contain different selfie cameras. Samsung Galaxy S10 covers with 10MP Selfie Camera while Samsung Galaxy S10+ contains an additional 8MP RGB Depth Camera at the front. 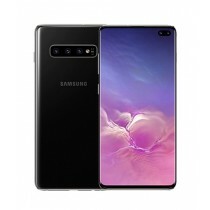 Selfie cameras of both models vary the Samsung Galaxy S10 price in Pakistan and also add another remarkable factor that doesn't easily available in any smartphone. The invisible security with an on-screen fingerprint sensor keeps securing your data without affecting the beauty of the display. The ultrasonic feature ensures the possibility of a fingerprint sensor at the front of the screen instead of the back which could sense the 3D ridges of the user's finger. A user can unlock, drag, and hold both models of Samsung Galaxy S10 with full security and confidently save your important files. Samsung latest mobile contains multiple features which were not available in other smartphones earlier and wireless Power Share is one of them. Now you can share the power from other smartphones either you have Samsung Galaxy S10 or Samsung Galaxy S10+. It is one of the remarkable features of Samsung new mobile that will definitely inspire the buyer beyond their hopes. What Will be in the Box? Samsung Galaxy S10 doesn't launch yet in Pakistan but we are following our aim of bringing the latest genuine smartphone for our Pakistani customer on a priority basis. You can place pre-order Samsung Galaxy S10 and Samsung Galaxy S10+ at our online store and book your smartphone before it arrives in Pakistan. Our pre-order campaign already started from 21st February 2019 and it will continue up-till 15th March 2019. You can avail our remarkable services in that particular duration and also get the chance to receive 10,000 mAH battery pack and level u pro with any model of Samsung Galaxy S10 and Samsung Galaxy S10+. We will start dispatching orders of Samsung Galaxy S10 and Samsung Galaxy S10+ from 7th March 2019 to get the original smartphone on a priority basis by placing an order as soon as possible. Samsung latest collections include Galaxy S10, Galaxy S10+, Galaxy S9+, Galaxy S8+. iShopping.pk confidently inviting for our showcased catalog for the best nominal prices in Pakistan for all Samsung Phones.